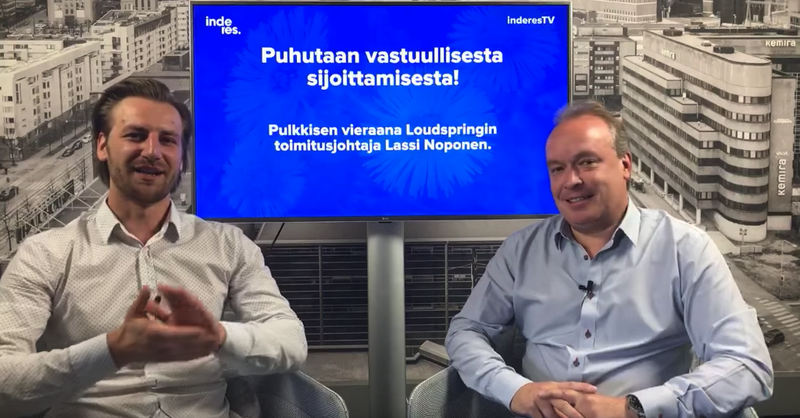 I recently had the pleasure of being interviewed by Verneri Pulkkinen on Inderes TV and the topic of the conversation was responsible investment or what is commonly referred to as SRI (Socially Responsible Investment). Loudspring recently signed up with Inderes to undertake detailed analysis of us and our portfolio companies and this was a chance to reach out to their audience and also begin to educate them on who we are and what we are all about. We have come to understand in the past few months that our stock is a challenging one to analyze and that we could do a better job in explaining the Loudspring value proposition as a stock. When I started as the new CEO, we promised to work on this issue. You can read about it here. Whether you are an institutional investor or a smaller retail investor, your money has an impact. Investment decisions have huge impacts. Whether you are an institutional investor or a smaller retail investor, your money has an impact. As I discussed with Inderes a week ago, it is a step in the right direction that the SRI has grown, but I think it is not enough. We have to do more if we are going to avert a climate catastrophe and clean up some of the mess the world is in right now. During my interview with Verneri from Inderes, I also had a chance to touch on some of the shortcomings of SRI, this approach to investing and assessing the performance of companies in this way. I also tried to highlight what I think are the key differentiators when looking at Loudspring and SRI. Revenue and growth can be found through solving real problems in the world. At the heart of it all, it is now clearer than ever to my team and I that yields from investment and positive impact go hand-in-hand. They are no longer opposing forces as they may have been traditionally. Revenue and growth can be found through solving real problems in the world. Our own portfolio revenue (unaudited) over the past year (growth of 77% on 2016 levels) and our impact for 2017 (107 000 tons CO2 and almost 14 million m3 of water saved) is evidence of this fact of revenue and impact going hand-in-hand. As Loudspring portfolio companies grow, positive environmental impacts are achieved. You can read our impact results here. But is this all there is to impact? Impacts can be environmental, such as decarbonizing electricity production, saving water and cultivating food and fiber that is regenerative rather than destructive. Impact can also be about poverty reduction and access to things like basic hygiene products in remote locations, and light so that youth in developing communities can satisfy the basic need to read after dark. It can also be simply about more efficient use of resources that are currently being wasted. The world has evolved and the greater the impact, the better the chances of a company often has on winning the market. Tackling such problems does not need to reduce financial returns. The world has evolved and the greater the impact, the better the chances of a company often has on winning the market. Winning in the long run also means being able to recruit the best talent, attract customers and investors, and the motivation to do good and make a positive impact when it comes to the mission of a company is a very strong value proposition on all markets today. Screening the worst and settling for the ‘less bad’ isn’t going to get the global economy moving at the right pace we need it to if we are going to turn this ship around. SRI is quite different to what I have just outlined. In my opinion, it is more about reducing negative impacts through business activities, rather than undertaking business activities that bring positive outcomes. Of course, it’s a good thing to pay attention to where you are investing, but the traditional approach to screening the worst and settling for the ‘less bad’ isn’t going to get the global economy moving at the right pace we need it to if we are going to turn this ship around. It is a step in the right direction, but what we need is an emphasis on truly highlighting and funding the companies that are tackling the big issues head on. It is much less politicians who are guiding the economy than investors and consumers. At Loudspring, we develop companies that have a great positive environmental impact. In a globalized world, capital and investment can transform industries and even our perception of what is possible, or even normal. An example of this is how the Internet has been able to disrupt legacy industries and ‘middle men’ by creating more direct links and trust between companies and their customers, as well as between citizens of the world. Capital is the guiding force of development in the world, whether that be through consumption choices by people or investment decisions of funds. It is much less politicians who are guiding the economy than investors and consumers. This is our globalized time as people, and as investors big and small. We have a tremendous amount of power and we need to use it for a better and cleaner future. SRI is a great start for funds and retail investors to begin being a part of the change the world needs, but it is unfortunately not enough. What we really need is investors to put their capital, and consumers their purchasing power, to work by supporting the companies that are innovating their way into solving the big problems and this will also be a major source of profit. To do otherwise is to miss the opportunity that for returns that is presenting itself and the responsibility we have for future generations.